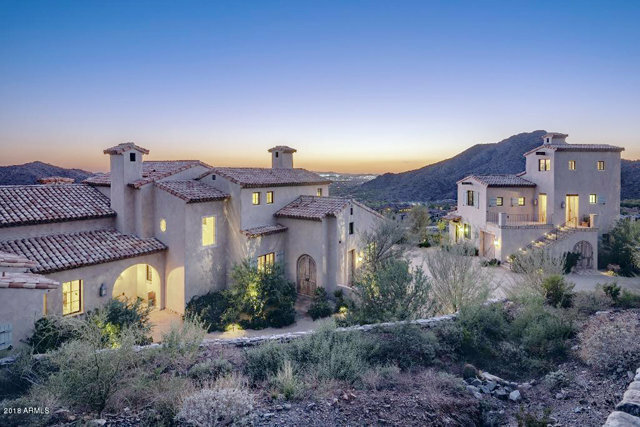 Single Family - Detached - Scottsdale, AZ French Farmhouse Estate in the Upper Canyon of Silverleaf. One of the most dramatic view homes with multiple structures imitate a Mediterranean village on a hill, overlooking the valley below. This 7,465 sq. ft. custom estate designed by Erik Peterson at PHX Architecture, built by Sonora West Development and interior design by Caroline DeCesare Design Group. Completed in 2016 including 6 bedrooms, 7 full baths, 2 powder baths, 4 car garage, private study, wine cellar, potting shed and a large separate guest casita. Authenticity and charm blend casual yet refined materials and finishes including; hand plastered walls, tumbled limestone and refined wood floors, reclaimed beams, stone mantles and expansive windows throughout. Breathtaking views from the private negative edge pool, plus extensive outdoor living spaces capture stunning views to Camelback Mountain and incredible panoramic city lights. Recipient of the 2018 Luxe RED (Residential Excellence in Design) award in the classic architecture category for the southwest region.